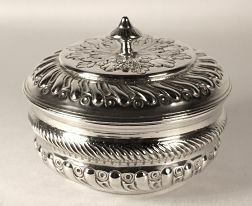 lidded and of circular form with repousse gadrooned upper body and spiral fluted lower body raised on a plain round foot. 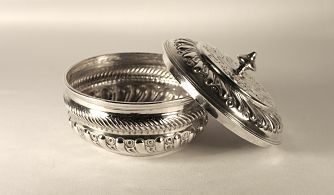 The pull off lid has spiral fluting to the border and foliage to the centre with silver finial. There is a clear set of hallmarks to the base. 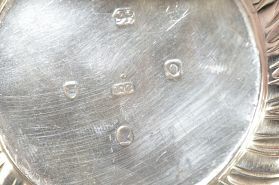 The lid also displays the maker's mark, date letter and lion passant.